The term Bren Carrier is widely used in connection with the Universal Carrier but in fact Bren Carrier was the original terminology for a specific vehicle that was to develop and became one of the most widely used vehicles in the British Army. The Bren Carrier was exactly that a carrier conceived to transport men, ammunition and a machine gun to the point of battle. The development of the Carrier concept passed through many stages starting in 1917 through to the 1950s. In 1928 Carden-Loyd were the first to produce a range of machine gun carriers initially manned by the Tank Corps, but it was soon realised that this type of vehicle had the ability to greatly extend the range of the infantry. Jump forward through the Vickers Armstrong’s Scout Vehicle, Dragon Light Mk IIC, Carrier Machine Gun No 1 Mk I, General Purpose Experimental vehicle and several other variants and by 1937 we have the first production models of the Carrier Machine Gun No 2 Mk I entering service. These carriers were originally fitted with the Vickers .303 Medium Machine Gun but later equipped with the .303 Bren Light Machine Gun and/or Boys Anti Tank Rifle. Prior to 1937 Vickers Armstrong had already starting building the Carrier Bren No 1 Mk I. 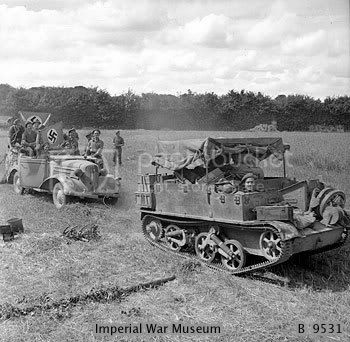 By 1938 we see the Carrier Bren No 2 Mk I and Mk II entering service and these vehicles although similar to the carrier Bren No 1 Mk I had modifications made to the frontal armour where a gunner’s protective shield was formed, with a firing slot and hinged flap to accommodate the Boys Anti Tank Rifle now being issued. Protective shields added to the vision ports but perhaps the most significant change was made to the front idler wheel which was raised higher on the hull side and lead to that distinctive nose up, tail down characteristic we associate with most Carriers. The higher idler wheel also required curved mudguards and these carriers were issued to the British Expeditionary Force (BEF) and saw service/action in France. After the defeat and successful evacuation from France so many carriers were left behind and captured by the Germans that they gave the vehicle their own designation. There were 3 vehicle types of Bren Carrier; Bren No 1 Mk I – Mild Steel Hull, no backrest or rear flap. Bren No 2 Mk I – Bullet Proof Hull and Engine Covers. Bren No 2 Mk II – Bullet Proof Hull and Engine Covers. All were powered by the 79E 60000 CS V8 engine. As many of the Bren Carriers No 2 Mk I were re-worked No 2 Mk I Machine Gun Carriers you do get variations in the look of the early Bren Carriers. In 1937 further improvements were made and the result was the Carrier Bren No 2 Mk II and evidence would suggest that the Bren No 2 Mk I was slightly shorter than the Bren No 2 Mk II. Right enough of the potted history, back to the kit in hand. Mastered by George Moore, which speaks for itself, Resicast have produced a full resin kit of what I believe is the Bren Carrier No 2 Mk I and a very welcome addition to their carrier range it is. The kit arrives packed in a sturdy professional box, on the top and sides of the box are a selection of pictures of the finished build from various angles (always a handy reference). The box art depicts the product and manufacturers details along with contact information for Resicast. Inside wrapped in bubble wrap are 12 plastic zip bags containing the kits resin parts and 2 frets of PE along with the lower hull and engine deck. The parts are cast in light grey resin and are simply beautifully done. These are topped off and accompanied by a 24 A5 page booklet of instructions. The instructions are logically laid out and clearly match the appropriately numbered kit parts. A full listing of parts is included on pages 2 and 3 so that you can check you have received everything you need for a successful build. The instructions are of the picture type as normally seen in Resicast kits with additional typed information added where necessary. Having used this type of instructions before they are easy to follow and clearly marked. Also at the end of the instructions are a series of reference pictures and a Bren Carrier stowage diagram, all of which should assist the build/finish of the kit. Well long gone are the days of a block of resin with a few bits to add on. The parts are designed and engineered just as in a plastic kit but with much greater detail. There are way too many to describe but you have everything here you need to build a cracking representation of a highly detailed Bren Carrier from the beautifully cast hull and engine down to the break pedals. All stowage items like grenade boxes, track adjuster levers, spare parts box, stowage bins and weapons are included in the kit. Top all that off with two neat Frets of PE and what you have here is the making of a terrific, highly detail kit. I can’t see anything that has been missed off of the kit. You can see the level of detail for yourself in the accompanying photographs. This is a quality kit that reaches and maintains the standard we have come to expect from Resicast. Simply stunning is one way to describe the level of detail on the kit parts. Clean up should be minimal, the casting blocks should be easily removed with only some film to tidy up on the hull. Obviously care will be needed as there are many small parts that make up the kit, but without these the level of detail obtained simply wouldn’t be possible. Normal precaution should be taken when working with resin. Well this is simply another brilliantly detailed Carrier from Resicast. Hats off to George Moore for developing the Master and to Graham from Resicast for the quality of the production vehicle. This is a worthy addition to what is already an extensive range of Carrier conversions and full resin kits provided by Resicast. Bren Carriers saw service in the Mediterranean Theater of Operations too so you’re not limited in terms of finish for the build. If you have an interest in these vehicles then I highly recommend Nigel Watson’s Universal Carriers Volume 1 and Volume 2 as a point of reference. The introduction of the Bren Carrier into the available range of models opens up many possibilities for modellers for the early war period and this kit should be of interest to both vehicle and diorama builders alike. Probably not for the beginner but a kit to be savoured and enjoyed. Building in resin takes a bit longer but the results are often worth the extra care and patience required. Highs: Excellent detail and highly engineered. A cracking kit. Al, I could SWEAR you did a review of one with a tarp on it somewhere.... I only plan to build one, so price isn't a factor-- get the best kit. I like the Scout, but the photos are very small. Is there a place with more detailed ones? And do I need the stowage sets, too? It's a masterpiece in miniature, Al. I'll see if I can pick up a UC at Mosquitocon this Saturday. Older Tamiya kits turn up at shows all the time. Do you recommend one over another? Al, my Tamiya figures go into the trash or I give them away, LOL. It's all about the vehicle here. Thanks for guiding me through this. I'll be watching for a UC tomorrow. Al, I struck out at MosquitoCon (though did get an EW Jagdpanther, T-34/85 w Bed Spring Armor and the Gen 2 pontoon bridge German infantry. But if I run down a UC, I'll gladly give you the figures.